This cheerful floral necklace, designed and carefully handcrafted by jewelry artisan Busarin, inspires sentiments of spring renewal and rebirth. 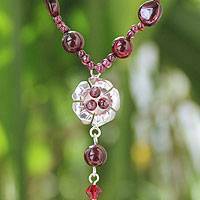 It features a lovely rosebud trio, incorporating elements of quartzite, garnet and fine glass beads. Vivid gemstones come together in this beautiful necklace by Nareerat in Thailand. 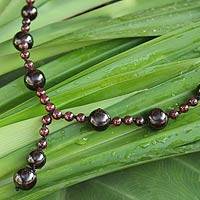 Crafted by hand, the floral pendant features cultured pearls, garnet, quartz and faceted beads. 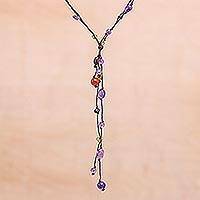 It is worn on a double strand of agates..925 Sterling silver plated brass clasp. 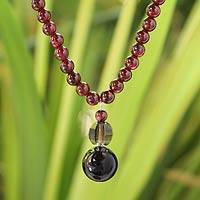 Garnet's burning elegance makes of this a dazzling necklace. Designed by Matta, it is crafted by hand and features stainless steel spacers. The contrasts in color and materials contribute to the necklace's sophisticated allure. 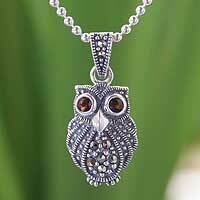 Features a sterling silver (.925) clasp. 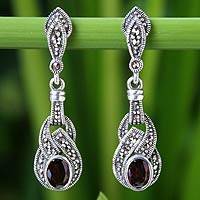 Thought to awaken the inner fire of creativity, garnets attract good luck. Somluck Komolmith selects the radiant gem for a sparkling choker. It hosts a floral charm of sterling silver. .925 Sterling silver. Orange petals conjure a luxuriant flower that blooms deep in the rain forest. Its tendrils and floral buds cascade in delicate array. 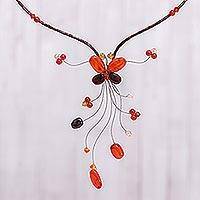 Combining carnelian and garnet, Busarin creates an extravagant choker. A feast of ravishing colors becomes a necklace of incomparable beauty in a design by Anusara. 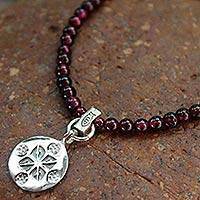 She deftly finds a harmonious balance in the contrasting hues of amethyst, peridot, carnelian, and garnet. This butterfly flies with wings of citrine and garnet bringing a message of ecstatic happiness. 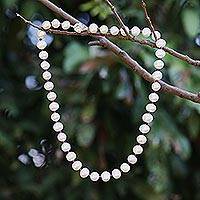 Busarin crafts the attractive necklace by hand in a show of admirable dexterity. 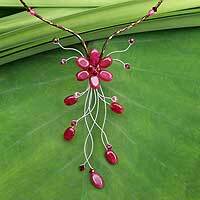 Crimson petals conjure a luxuriant flower that blooms deep in the rain forest. Its tendrils and floral buds cascade in delicate array. 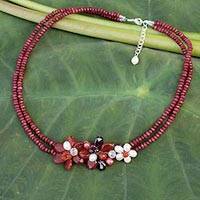 Busarin creates an extravagant choker with dyed quartzite and glistening garnet accents. 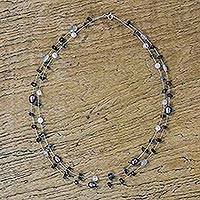 Precious stones and the treasures of the sea appear like mystical satellites, orbiting the dual bands of this necklace. 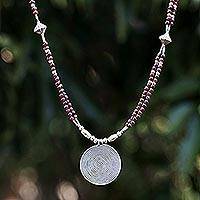 Matta strings garnet, rainbow moonstone, quartz, and cultured pearls on thin steel wire, the unpredictable composition imbued with modern Thai spirit. Steel wire with .925 Sterling silver hook. 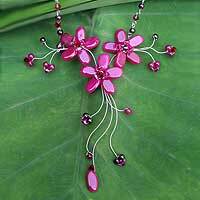 A symbol of the Christian faith, a cross centers this beautiful necklace. 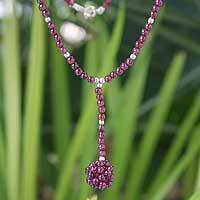 Anusara crafts it with gemstone beads to be worn on a necklace of uncut amethyst. 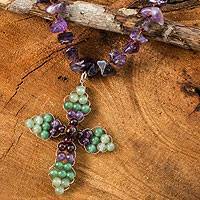 Globes of green quartz, garnet and amethyst form the cross, which is centered by a single tiger's eye sphere.